“The Plaza Coral Gables” Development Team is pleased to announce that the site preparation continues full speed ahead in order to be able to start the construction activities in the first quarter of 2018. 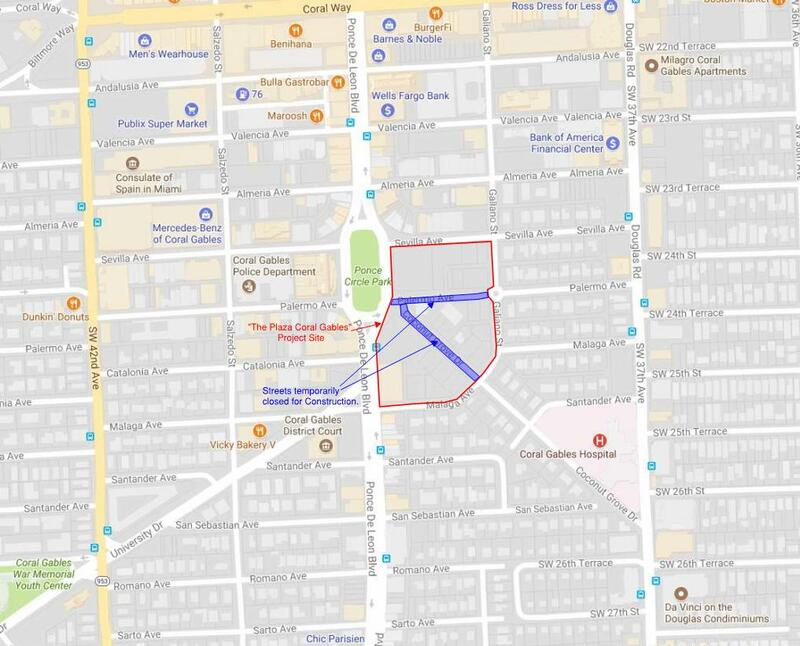 As the preliminary works (demolition, backfilling and material transportation) plus the future construction activities occur on all parcels of the Project Site simultaneously, the 1-block street portions of Coconut Grove Dr. and Palermo Ave. (contained within the project site) will be closed for the duration of the construction (please see below diagram). This will preserve vehicle and pedestrian safety while also allowing construction vehicles to do most loading/unloading activities, etc. from within the site without blocking Ponce de Leon or any of the neighboring streets. The proper traffic signalization, fences and gate, etc. are currently being procured and the actual street closures are scheduled to start in the next 2-3 weeks. Please click here for the full detailed MOT plan.